Gary got some new kicks this weekend! My husband, like me, has been a casual runner for years… We often run together after work, and we usually hit up the Fairfield Half Marathon and the Falmouth Road Race (as well as this weekend’s Piggy Trot!) every year. But when it came to proper footwear (or nutrition, hydration, actual training, etc. ), we never paid too much attention. In fact, we’ve gotten two-for-one kinds of deals the last few years on our Asics. Yep. I finally got myself fitted last summer before marathon training, and Gary just checked in with our friends at Marathon Sports in Mashpee on Sunday! I wasn’t even there – I dropped him off while I went for a run in the pool at my gym across the street. 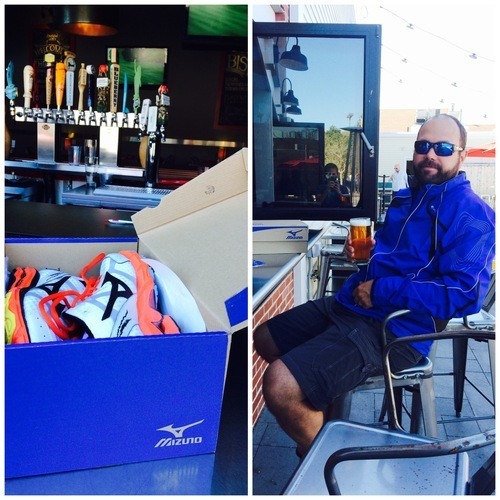 And he ended up with the Mizuno Wave Rider 17s, which are the very same as me!!! We toasted to sneakers and the beautiful weather at the outdoor bar next door, The Lanes Bowl & Bistro! So happy to see him in these, and for him to be enjoying our local run club and trail runs these days too! Gary is part of Cape Cod Rugby this time of year as well, but he’s registered for another Fairfield Half Marathon in June! I’ll be there cheering! Does your spouse run with you? Did you meet your significant other through running? I’ve heard some wonderfully sweet stories of runner love over the last couple of weeks! ← On the other side!